We've talked a lot about Canada Reads on The Reader over the last few years. The annual CBC event that gets Canadians reading and talking about Canadian fiction seems to be growing in popularity each year. 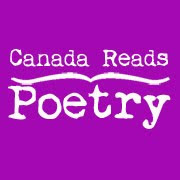 This year, the CBC has announced a new reading initiative Canada Reads Poetry. Partnered with the National Post's book blog The Afterword, this reading event isn't happening on the radio, but rather online. Each website has already featured a number of blog posts on the event and the poetry collections involved. As with the fiction event, there are five titles that have been selected and each is being defended by a celebrity panelist. Unlike the fiction event, which draws its panelists from all walks of life, each of the panelists for Canada Reads Poetry is also a poet: a decision I both like and dislike. I like it because (in addition to in effect highlighting ten poets instead of five) it brings a sense of expertise to an area of writing that many people are afraid to explore, and poets will be able to passionately speak about poetry in a way that will hopefully appeal to everyone. I don't like it, (and I'll admit this could directly contradict the reason that I like it) because it seems to perpetuate the sense that poetry is for people who like poetry and no one else. I'll be curious to hear how the debate shapes up. A live online chat discussing the selections will be held Wednesday April 20th (that's today!) at 3PM Atlantic. You can view the chat here.